Duck Dynasty – They’re Back, Jack! Phil and Miss Kay are about to celebrate their 48th wedding anniversary and the rest of the family would like to give them the wedding they never had. 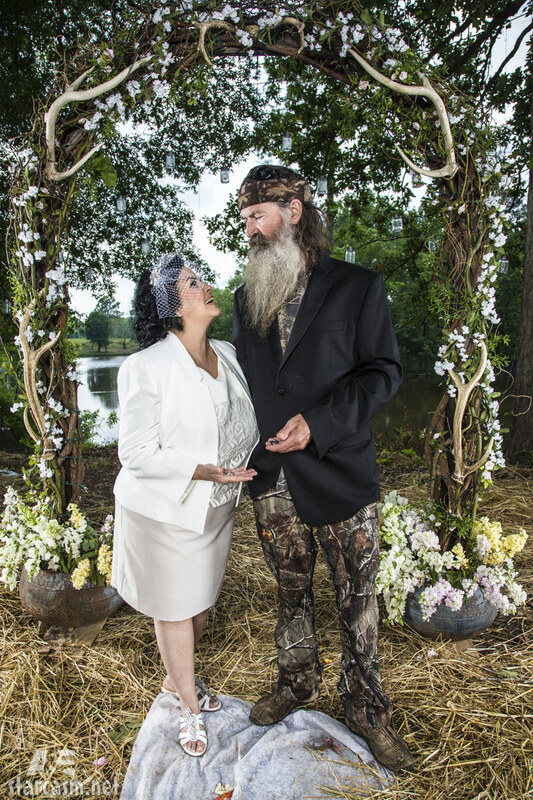 Maybe not the whole family – Willie and Jase aren’t as excited about the idea as their wives are. Si says that they’re whipped and demonstrates just what that means by snapping his imaginary whip in the air. Godwin tries the whip idea but it didn’t look quite the same. Si’s right, of course, and the men are given their marching orders by Korie, Missy and Jessica, Uncle Si is assigned to keep Phil and Miss Kay busy. He’s the “master distracter” – this is a military-like operation after all and he did survive Viet Nam. The conspirators put Si on the phone with Miss Kay so that he can come up with an excuse to keep them busy. When she answers, Si tells her that they have a surprise for her, which doesn’t go over very well with the rest of the family. He recovers, somewhat, and tells her that he’s going to take them out for ice cream, so they should be ready to go in the morning. Phil and Miss Kay are sitting on their front steps, ready to go and Si is nowhere to be found. When he does finally show up, he’s ready with some interesting explanations as to why he’s late. He almost ran out of gas but didn’t stop to fill up because then he’d be late. Phil points out that he is late, so Si says that he would have driven faster but that drinks up more gas so going slower made him late. As Phil says, Si’s a “logic vacuum”. Phil just wants to get going and get some gas for Si’s truck but Si decides they should take Miss Kay’s truck instead and he’ll be the chauffeur for his planned trip down memory lane. once they’re gone, the family gets to work putting everything together for the wedding ceremony. The men are supposed to pick up flowers and tables and the cake while the wives see to it that it all gets done. Mountain Man arrives with the arbor – mm-hmm. It’s in pieces but he says that he knows how to put it together – mm-hmm. Alan, another brother who we haven’t seen before arrives. He’s a preacher and apparently he owns a razor which bothers the rest of his bearded brothers. Si’s first stop on the love tour is a ramshackle house. He announces that this is where Phil and Miss Kay first met and that a friend of theirs, Debbie Gibson, introduced them. Phil and Miss Kay have never seen the house before – Phil says that it’s a dilapidated crack house – and that nether he or Miss Kay know anyone named Debbie Gibson, other than the singer. It doesn’t matter, because Si knows what he knows and he knows that they have another stop to make. This time it a fireworks stand and he insists that this used to be the high school football field where the two really met. They’re sure it isn’t but they let Si have his moment anyway. They still want the ice cream they were promised, but Si’s inside the tent, buying fireworks. After another long drive, without any ice cream, Si pulls into a wooded area and tells Phil and Miss Kay that this must bring them all sorts of good memories. All Phil sees are a lot of trees but Si says that one of them is important. Then they notice a tree that has a heart and initials carved into it. Eureka! The initials are Miss Kay’s and Phil’s and . . .Si’s? It seems he added them so that they’d all be together forever. The wedding preparations are just about finished. Mountain Man’s managed to assemble the arbor without any help and it looks good – mm-hmm. Jep arrives with the cake, the men are sort of in tuxedos and the ladies have put on their dresses. There’s an argument over who should be Phil’s best man, with Willie claiming that the job should be his as CEO of the company. Then Si pulls up with the happy couple and they’re greeted by the whole family who tell them that they’re going to have that wedding they always wanted. After Miss Kay, Phil and Si put on their wedding attire, Phil announces that the best man is going to be Si. He hands Si the wedding rings and Si proclaims himself the lord of the rings. This entry was posted in Duck Dynasty and tagged A&E, Duck Dynasty, Godwin, Jase Robertson, Jep Robertson, Korie, Miss Kay, Mountain Man, Phil Robertson, Si Robertson, Willie Robertson. Bookmark the permalink. 12 Responses to Duck Dynasty – They’re Back, Jack! Happy Birthday Empress of Aiken! Happy, happy day Empress! May it be fabulous from beginning to end! If I had known today was your birthday I would have gone Postal……but I will eventually!! lol!! Happy Birthday!!! Happy Birthday, Empress!!!! Hope you have a fantastic day! Best wishes for a wonderful day, Empress. Hope I am not too late for cake! Happy Birthday Empress!